Copp Church was built in 1723, a simple rectangular building with four windows on either side. It was called Copp Chapel and was what is known as a chapel of ease for St. Michaels church which had previously been the only Anglican church in the neighbourhood. Copp was still in the parish of St. Michaels and was served by a resident curate-in -charge. The interior was also simple, with box pews, a three decker pulpit and a stove which often had to be re-fuelled during the service. After the Battle of Waterloo, in 1815, in which Wellington finally defeated Napoleon, Parliament made certain grants to churches as an offering of thanks. The King’s Arms at the west end of the south aisle mark the receipt of such a grant in 1818. The church was enlarged in 1840 and the tower, previously a squat structure, was raised. In 1847 the large Diocese of Chester, in which Copp had been, was divided and Copp was now in the Diocese of Manchester. Two years later, in 1849, the independent parish of Copp St. Anne was formed,incorporating the villages of Great Eccleston, Elswick and Little Eccleston-with-Larbreck. 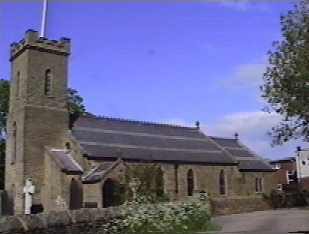 Little Eccleston had previously been in the parish of Kirkham, though the inhabitants had worshipped at Copp which was of easy access across the fields. The east window is a memorial to the Rev. Thomas Hathornthwaite who was the first vicar of the parish, having come as the curate in 1841. As the church is dedicated to St. Anne, St Anne is depicted in the window along with St. Thomas. St Anne is also depicted in the more modern window in memory of Miss Mary Ellen Bradshaw. As Miss Bradshaw taught for many years in the school, St. Anne is shown teaching the Virgin Mary as a child. In 1884 the church was enlarged again into the church we know today. The exterior was now clad with Yorkshire stone, the tower raised to 45 feet, choir stalls fitted and the old box pews replaced with open seating. An organ was installed in 1886, replacing the earlier harmonium which in turn had replaced the instrumentalists playing in the gallery. The 150th Anniversary of the establishment was celebrated on St. Anne's day, July 26th 1999.